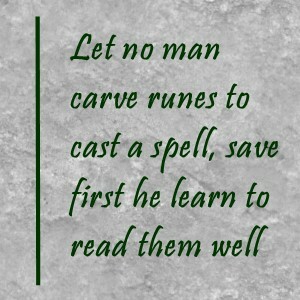 Let no man carve runes to cast a spell, save first he learn to read them well. I couldn't find the original source, though every website where I found this quote credited a "viking poet". I wanted some context for it. While I recognize that many ancient authors (writers of all kinds) are unknown, what I was searching for was the rest of the poem or the item on which it was carved, anything that would offer more insight into this statement. I was intrigued by the wording, because it appears to address what it meant to be a rune master - one must know how to read the runes well first. Once they master that, then they may carve runes. Perhaps the most interesting part is the bit about casting spells. This implies that runemasters did spell work, but Wikipedia, for example, states that "a runemaster is someone who specializes in making runestones". It did not include spell work or casting runes. Who were the ancient runemasters? Were they stonemasons, poets, spell casters, healers, readers of the Runes or some combination of these roles? Were they men or women or both? Many of the websites I investigated said that runemasters were usually women (but they provided no citation). Tacitus, on the other hand, claimed it was the local priest (chieftain) or the father of the family who read the runes, and other sites state that with few exceptions (e.g., seidr witches), men dominated rune magic. The term runemaster seems to be a moderately new addition to our language, according to Webster's Dictionary, where a runemaster is defined as a maker of runes, a magician, with Odin being the greatest runemaster of the ancient Germanic world. Webster also says that the first known use of the term was in 1869. Confused? Let me summarize what I believe to be the most accurate or likely interpretation. If you read my blog with any regularity, you know that I lean strongly toward factual information when it comes to understanding the history in which Runes were used. For that reason and because of my own research into what life was like before and during the Viking Age, I believe that men did dominate rune work/magic/runestones. I don't believe they were called runemasters. I'm not sure we can ever know who or what a runemaster really was or was called a thousand year ago. This little foray into the term runemaster opens the door for more posts on the subject. Look for one or two of those later this year. For the past few years, I've chosen a Rune to guide me through the year. I've approached it as an individual Rune (Thurisaz) and I have performed some rituals (Sowilo and Ansuz) to make my determinations. This year was different. It didn't fee like a ritual so much as a whittling down of choices. Unlike 2018, where my Rune for the year came to me clearly at least a month early, 2019 has been incredibly indecisive. 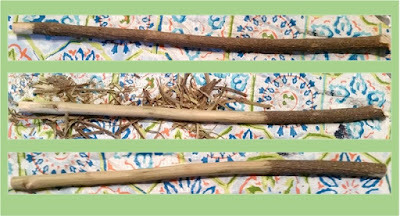 At least six Runes presented themselves as potential candidates, and each one has a reasonable case, starting with some of the Runes that I burned into my wand at the end of December. Sowilo and Ansuz have already been Runes for the year, so I removed them from consideration. That left Tiwaz, Eihwaz, Ingwaz, and Kenaz from the wand. Beyond that, Berkana has been presenting itself far more often than usual as has Algiz. What it came down to was what each Rune represents versus what I know about and will need in the coming year. Tiwaz, Tyr's Rune, has always been a good Rune for me, representing three important aspects of Tyr - sky god, warrior god, and sacrifice. They are often interconnected in any given circumstance. The sky god has a bird's eye view to create strategy for the warrior who will persevere, but sacrifices will be made along the way. Eihwaz, the Rune of the yew tree, is a Rune I use for specific moments. It reminds me of my inner strength and helps me to overcome challenges. Ingwaz, Freyr's Rune, surprised me as an option and was the first one that I ruled out. This is a fertility Rune. While I believe some things that are in play are moving forward, I would not say that the time is ripe for much at this point, though I could see Ingwaz coming into play in the next year or two. Algiz came in third. The Rune of self-defense and protection offers an important reminder that I extend from the idea of having to defend yourself to the idea of taking care of yourself. Self care is a good idea, but not always easy to accomplish. Plus, it means different things to different people. The last two were almost impossible to choose between. At one point, I began doodling potential bindrunes, joining Kenaz and Berkana. It just didn't feel quite right though. In the end, I had to choose one. Berkana fits very well into where things are in my life at the moment, representing beginnings and the birch tree. I believe this year will be a year of beginnings for me on many fronts, and I have a strong affinity for birch trees; in my mind, they are inextricably linked to Heimdall, the watchman of the gods. 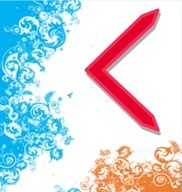 Kenaz, the torch Rune wins out though, because it constitutes the way in which I must approach all of the beginnings that are coming my way in 2019. Kenaz, the torch, is human made fire, which embodies human ingenuity and creativity. Mine has never really been a traditional path, though it's had glimmers of it. It has required out of the box thinking, making something out of seemingly discreet parts, and getting up every time I get knocked down. In short, I've had to get creative a lot in my life. That's right. I made a wand. Last year, ebbed and flowed...and swirled...and cascaded over cliffs. Good moments and bad. And, I wanted to end the year on an upswing, so...yeah, I made a wand. It's also why my post is coming in January instead f December, but it was worth the one day delay. The wand is made from a piece of lilac bush wood that I cut last spring, just before the bush bloomed. Lilacs are my favorite flowers and, while I'd love a set of Runes from lilac wood, I've never been able to get a satisfactory-sized piece from which to cut them. I'm happy with the wand, and it does have six (actually seven) Runes carved into it, which I will get to shortly. It was pretty easy to make the wand. I cut it to size and smoothed the ends, then shaved all but the handle. Next, I burned my first Rune into the handle end - Jera. Jera, as many of you know, is my guiding Rune, so I wanted it to be at the wand's foundation. I suppose you could think of it as the wand's core. The wand shaft was pretty smooth after I removed the bark, so I didn't sand it at all. With an exacto blade, I carved the simple design into the shaft. This made the carving/burning easier. (None of this work was visible int he pictures I took, so I didn't include any.) The lines on the shaft are to move the energy through the wand and out the tip. I made four lines following the natural curves of the wand, so they are not perfectly straight. Using a few different wood-burning tips, I burned the lines. All that was left was the Runes. I thought about each one and its placement for quite a while even though I had been mulling over which Runes to carve since I cut the wood from the bush. I want this wand to help guide me through 2019 and likely a lot farther than that. I chose Sowilo, the sun, a beacon leading to safe harbor. I placed it closest to the tip. Ansuz was next on the same side as Sowilo. For me it represents my writing, beyond the Rune's instinctive wisdom. Turing the Rune one quarter, I added Tiwaz, Tyr's Rune. I have a strong affinity for Tyr and appreciate the three aspects that I feel through his Rune - sacrifice, strategy, and perseverance. Another quarter turn and I burned in Eihwaz to remind me of and call on my inner strength, and Ingwaz for Freyr. Ingwaz doesn't simply hold fertility, it's the way it feels comfortable to know that you are ready to take the next step in any endeavor. It tells you that you're ready. The last Rune was the toughest, but once I chose Kenaz, it felt right. Kenaz represents the torch, human-made fire and, by extension, human ingenuity and creativity. Kenaz has come up for me a lot in recent readings, so I felt compelled to see where my own creativity could lead in the coming months. Once the Runes were carved, I darkened the handle a little bit by rolling the side of a hot wood-burning tip up and down it as I turned it to make the coloring even. To complete it, I protected the wand with a nontoxic sealant. And, now it has a place in my sacred space with other my other special items. 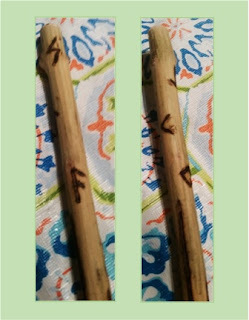 I want to note, that while I wrote about the Runes on the wand and why I chose them, for now at least, I will not be using this wand for anything other than ornamentation of my sacred space and a visual reminder of what I want to have guiding me through the coming year and beyond.